Disabling a Car With an Electric Charge - Science Fiction or Science Fact? In the movie “2 Fast 2 Furious”, officers in a police helicopter try to disable a Mitsubishi EVO by shooting the rear door with a harpoon gun that attaches a powerful electrical device. Fortunately for the hero, a bad connection gives him just enough time to pry it off and fling it onto a police car, quickly disabling his pursuer. Is such a device possible in real life? If so, how would it work? First, can a massive electrical charge disable a car? A massive electrical charge could definitely damage a vehicle’s engine control unit (ECU). The ECU monitors and adjusts the air fuel mixture and the spark delay, and without it, the engine would cease functioning (assuming the car was built anytime after 1994, that is). A massive electric charge coul also damage any number of sensors that are connected to the ECU, but most likely sensor damage would only put the car into a “limp home” mode, reducing power output substantially but leaving it still drivable. Another possibility: With enough of an electrical shock, the alternator could be damaged or destroyed. For some vehicles, this will have no impact until the car is parked. However, it’s more likely that the vehicle will suffer a power loss at some point after the alternator as lost (perhaps in just a few minutes). Lastly, modern cars have two fuse boxes: one next to the driver’s seat for accessories, and one under the hood to control the engine. An attack on the electrical system could blow any number of fuses, most of which will cause major problems (if not complete power loss). However this is easier said than done, as the electrical charge would have to be delivered in a very specific way. What if the harpoon in the movie was an EMP device rather than an electrical shock device? A Marx generator creates electromagnetic pulses (EMP) using spark gaps, which might explain the electric arcing from the film. However, a car-disabling generator would have to be much, much larger than the harpoon shown in the movie. 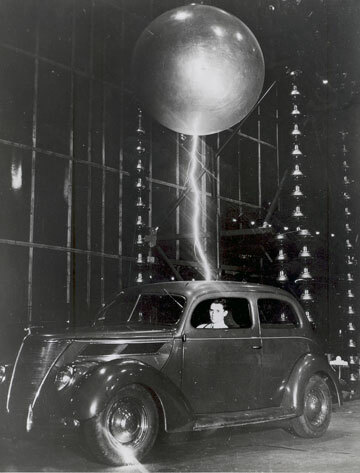 Even then, the electricity would follow the path of least resistance, which means the metal car body would probably short circuit the EMP generator. The police car attack (rather than the harpoon) is a bit more plausible: If a generator could be built that size, it might be able to arc while attached to the plastic grill. But still, this is a whole lot of science fiction and not very much science fact, so the EMP generator is out. What happens when electricity goes through the body of car? Probably not much. The electricity will flow safely through the car body and then dissipate to the ground through the tires (which, contrary to popular belief, are not electrical insulators). It’s possible the charge could disrupt the vehicle’s electronics (perhaps by arcing through some key wiring harness), but highly unlikely. Same goes for a lightning strike on your car, by the way: as long as you’re not touching anything metal inside your car, you and your will probably be unharmed. What if the harpoon hit the tailpipe? The exhaust is bolted to the engine, which would give the electricity a direct route to sensitive electrical components. However, exhaust system manufacturers use mild steel coated in aluminum, titanium, or pure stainless steel for making exhaust pipes, none of which are good conductors of electricity. So, can an electric charge disable a car? As seen in the movie, no. However, a helicopter-portable Marx generator is being developed for the military. The finished “car stopper” will be a four foot (1.2 meter) dish weighing around 55 lbs. (25 kg) with an effective range of 650 feet (200 meters.) The Marines and Air Force hope to use this to disable vehicles during hostage situations. If the creators of 2 Fast 2 Furious wanted to honor science, they would have disabled that Mitsubishi with something that looks less like a rifle and more like a radar pod sitting on the belly of a chase helicopter. Author Jason Lancaster loves Hollywood car-chase movies, science fiction, and is an auto enthusiast with an engineering degree. He writes for Exhaustvideos.com, a place for listening to after-market exhaust systems. Leave a reply to Disabling a Car With an Electric Charge – Science Fiction or Science Fact?